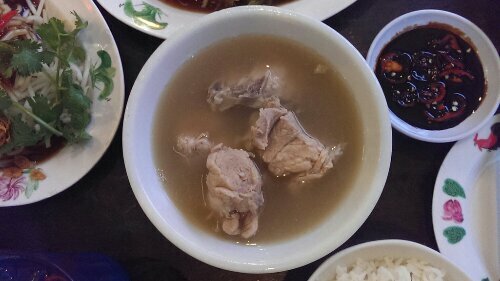 Founder’s Bak Kut Teh 发起人肉骨茶餐馆 @Rangoon Road (Singapore) | Get Your Grub On! Stroll down Bak Kut Teh Lane. I only had been to the shop on Balestier before but tonight looking for a quick meal I went to Rangoon Road for my pork rib dinner. I was positively surprised to find my preferred leaner version of ribs on the menu which I knew from ‘Ng Ah Sio‘ but had never recognised at ‘Founder’s’ before, so this was what I was going to have. The meat was nice and tender with quite big chunks of pork that were easily nibbled off the bones. The soup was rich and had a good flavour, just wasn’t as peppery I would have wished for. So this branch is actually quite nice place with some outdoor seating, a big menu of tasty dishes to chose from and is less crowded than their original shop. However I like my ‘Bak Kut Teh‘ as pepper loaded as possible so I might be walking a couple of houses down the road for my next round of pork tea.